A few days ago, we heard rumors that the HTC Desire HD might not be getting updated to Android 4.0 Ice Cream Sandwich due to performance issues, but luckily now HTC is stepping up to make things clear and refute those claims. The HTC Desire HD and also the Desire S are both getting updated as planned. "We remain committed to providing customers with the latest software updates when possible. 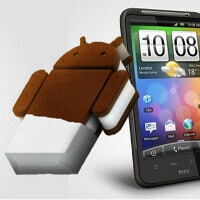 As such, we are pleased to confirm we are still on schedule to deliver an Ice Cream Sandwich upgrade for both the HTC Desire HD and Desire S."
Originally, Canadian carrier Telus started the rumor by mentioning that the the Desire HD is performing poorly on ICS. It’s still not clear whether that particular carrier will have the device updated, but at least for all the rest, HTC has confirmed the upcoming availability of the update. One of my many reasons for buying an htc product...updates. Keep it up htc!